Can you say comfort food! I have recently learned the beauty of braised chicken. 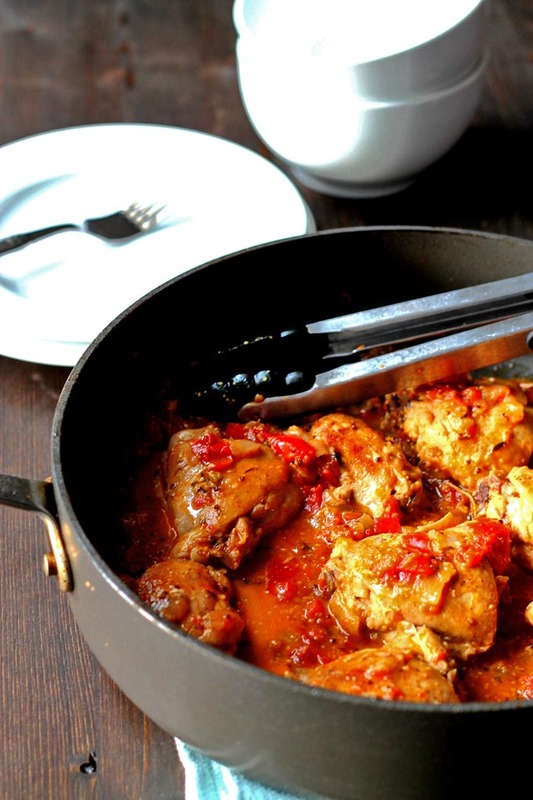 Tender and juicy chicken on the bone, slow cooked in a sauce to die for. The sauce for this recipe is a tomato base with broth, wine, and mustard, but I can guarantee there will be many other sauces for braised chicken coming down the line. I have had braised chicken before, but I havent really used this method to do a lot of cooking so far. I have said this before, but Debbie and I both love love comfort food that is also healthy! Who doesnt I suppose, but we get really excited to share our comfort food recipes that can actually help you shrink your waistline and make your family happy to eat dinner with you too. Your man will beg you to take the leftovers for his lunch too! 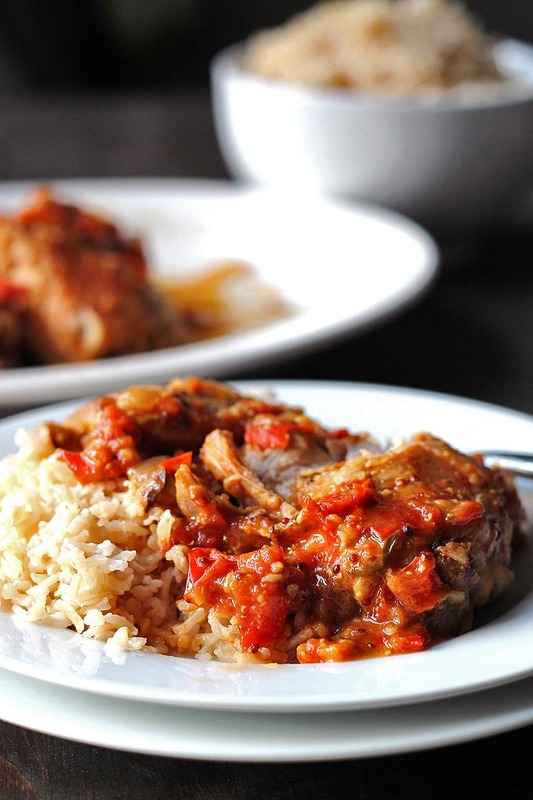 Braising chicken is a combination cooking method that uses both dry and moist heat. The meat is first seared over high heat which caramelizes the outsides to add flavor. Then a small amount of liquid is added for the remainder of the cooking time. 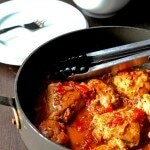 The liquid makes the meat stay juicy and also mingles with the juices of the meat and creates an amazing sauce. The beauty of this method is that you an change the dish entirety just by changing the liquid that you add to the meat. Using broth and vegetables to create the sauce during the braising process is the way to keep this dish healthy. You can make the dish more rich if you like by adding cream or butter to the sauce, but its so good without all that too. 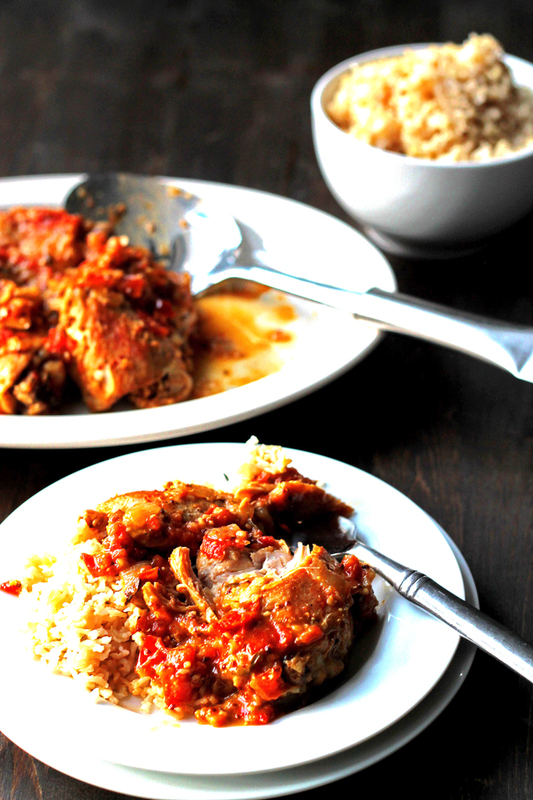 Serve this dish with brown rice or mashed potatoes. So freeking good with either. OR, if you are seriously watching your carbs, you could try eating this chicken and sauce over a bed of zoodles. YUM! Im going to have to try that soon. Debbie and I are firm believers in quality ingredients. Choosing quality meat is especially important for the health of our families and for the health of our planet. We always choose grass fed or free range meat and local whenever possible. We’re so thankful for companies like Butcher Box who sell quality grass fed and pasture raised meats and who truly care about the welfare of the animals. As an animal lover and a carnivore, that makes a BIG difference to me. 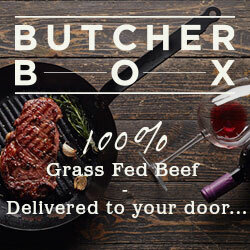 What’s even better is that Butcher Box also has a fabulous price point and your order gets delivered directly to your door! If you click the link below, you will get 10$ off your first order and free bacon! Start by seasoning both sides of the chicken with salt and pepper. Heat olive oil over medium-high heat in a big pan with sides. When its hot, sear the chicken on both sides till it is nicely browned and remove from the pan and set aside. It should take about 3 or 4 mins per side. Add the onion to the pan and saute for a few mins. Add the garlic and 1 min later, add the wine to de-glaze the pan. Scrape up any bits of the chicken that have been stuck to the pan. Add the tomatoes to the pan and saute for a few mins. Add the mustard and the chicken broth and give it a stir. Finally, reduce the heat to medium and add the chicken back to the pan along with any juices that have pooled under the chicken as it has been resting. Cover and cook for 15 - 20 mins stirring the sauce around periodically. Check the chicken is done by cutting into it and making sure the parts by the bone are not pink anymore. Once the chicken is done, season the sauce with salt and pepper to taste. If your sauce seems to be evaporating too quickly or you want moresauce, just add a little wine or chicken broth as you are cooking. Yum! I learned something new too! I’m totally making this next time we have chicken, not having to use the oven saves us a lot of fuss! Yes Jenn, this method will work great for you guys! We’re Back & a Wedding!